For fashion girls, it is always essential to keep updated with the latest trend. Doing new things to yourself is always fun. Trying new hairstyles or makeup makes everyone feel good, especially girls. With little creativity, you can keep yourself updated with following trend. When girls have to maintain themselves, they have many things in mind. Out of all those things, making nails pretty and shiny is essential. Clean and manicured nails are attractive but a good design will make them look stunning. A beautiful nail design adds quality to the nails making them pretty and shiny. With few following designs, all the fashion girls can get pretty nails that will make them more confident adding beauty to their nails. 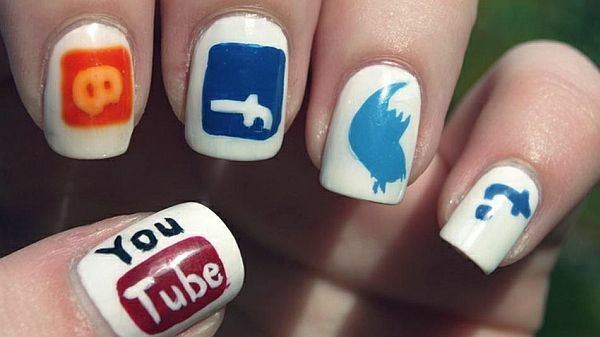 For all the girls who remain active all the time on social networking sites, this nail design is perfect. Doing this nail design is quite easy, but you will need different colors for making it. Choose some of your favorite sites, take the shades that match with the symbol or name of that site, and paint it like that. You can either make the same design on all the nails or choose different to add variety. For girls who want to look little unique and cool, make sure to add this design on the nails. No doubt, it is quite different from all those elegant and girly nail designs, but still it looks stunning. Make sure to have one shade of nail paint, shiner, vodka, and little pieces of newspaper. Start by applying nail paint with a brush that is dipped in vodka. Vodka makes nails shiny, giving long lasting effect to the nails. 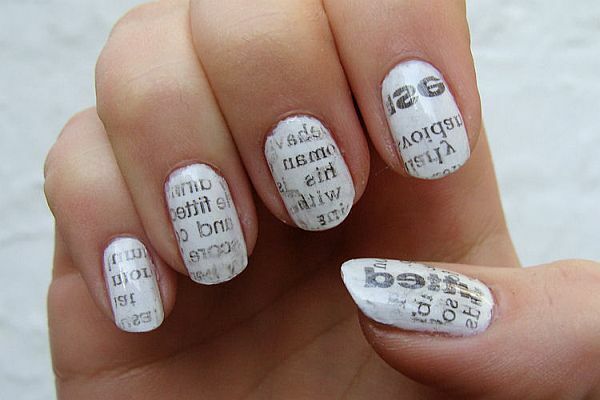 Now take little piece of newspaper and press it against the nails until the prints of the newspaper is on the nails. Let it dry and apply one coat of shine in the end for that glossy look. 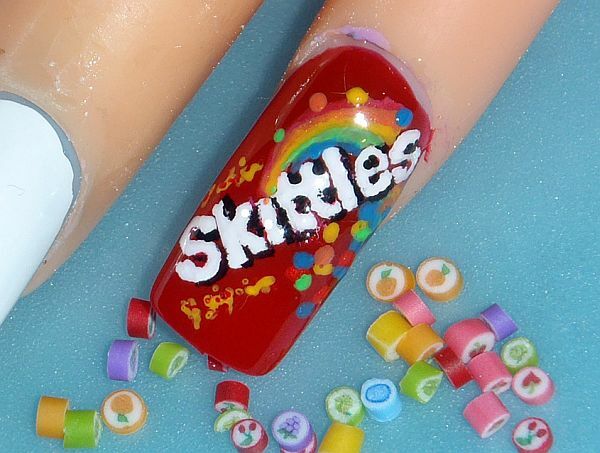 Nail design that can make the nails looks snacky. While junk food has become very popular, it can also décor the nails very well. When no other design is hitting your mind, making his design will do. Just collect all the shades matching your favorite snacks and make sure to have all. Think of your favorite snack or place it in front of you for the perfect design. Now start making the same on the nails and let it dry. 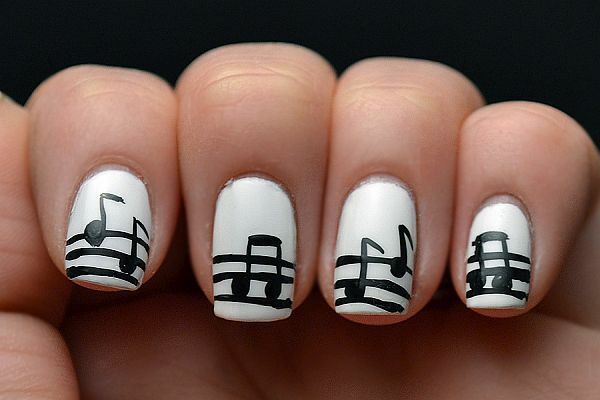 Try applying this design for giving your nails a musical touch. Gather different shades of nail paint along with a shiner and nail art pen. Just remind of your favorite band or singer and start making the design. For getting the picture perfect, place a HD picture of the singer in front of you. A HD picture will allow making even the minute details of the artist. If you want to show off favorite singer or band to the world, try considering this nail design. Girls always want those shiny and pretty nails that give them a unique look. Make sure to be in touch with what is trending and decorate the nails with the same, to make your hands look pretty and stylish. Scorpion PC mod – Stinging technology!